This post was revised June 24, 2010 at 9:35 am to reflect a change in article re-review procedures. Modifying your articles after they’re live doesn’t have to be difficult – just keep these 4 tips in mind before you hit submit. Back in February, we gave you the option of editing your articles after they’d been approved and published. [view post] In order to maintain the quality of those revised articles, however, it’s still necessary to have 2 human editors review each one as if it were a brand new article. We call this quality-control step the re-review process. During this editorial re-review process, your old article version will remain LIVE and will still be working for you to drive traffic back to your site and build your credibility and exposure. 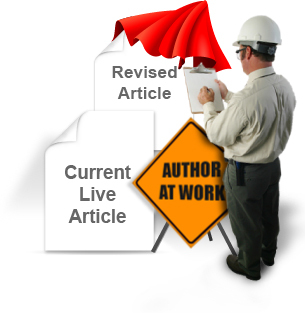 Once the article review is complete, the newly accepted version of the article will replace the old version. Unfortunately, there are times when the revised article doesn’t get approved. In that case you’ll be notified via email that you have 30 days to make the necessary changes and resubmit your article for another editorial review. This process repeats until the article is finally approved. But wouldn’t it be a lot easier to get your edited article approved the first time? Of course. The good news is that over the last few months, our Editors have come to realize that there are just a few primary reasons why edited articles don’t get approved the first time. In this post, we’ll share some tips to help you avoid these common re-review pitfalls. Match the name(s) in the Resource Box to the author(s) in the byline. – Surprisingly, this is the most common rejection in the re-review process. If you are listed as the author, then the Resource Box needs to either a) Make no mention of anyone (although companies are fine), or b) Clearly distinguish you as the author. This prevents the reader from wondering who really wrote the article they just read – which, in turn, increases your credibility. Check all your links. – You’ve spent a long time crafting your articles so readers will be compelled to click your links. Don’t blow your chance to impress them with a link that’s broken or that leads to a site without content! If you need to remove a link, be sure to take out any language referring to it in the body or Resource Box, or the reader will be very confused and dissatisfied. Follow our current Editorial Guidelines. – We’re continually raising the bar on the quality of the articles we’ll accept. That means articles previously approved may actually be rejected when put through the re-review process. And remember, that all articles are held to the same editorial standards regardless of author level or submission type. Only make necessary changes. – Don’t change more than you have to or continually change an article. If your changes are extensive, then perhaps it’s time for a new article. You’ll notice that most of the tips above are as applicable to newly submitted articles as they are to those that are being edited and resubmitted. So take them to heart for your next set of new, original articles as well. Either way, you’ll be well on your way to making the article review (or re-review) process as painless as possible. Leave a comment to share your tips for pain-free article submissions. Very useful – what would you advise if having reviewed earlier articles, one realizes the original title is a poor one. I would never suggest editing an already existing article unless there are grammar/spelling or other mechanical errors as these cause credibility concerns. I would keep most others as lessons and learn from them. You only get better with each one. The more articles you have, the more viral you become. Just keep writing and learn as you go. It would be great if we could redo the resource box and get the new box approved and then be able to apply it to old articles. I have some articles that are fine, but the resource box is outdated. (links to websites that are no longer in existance, etc. My question is can the resource box links be changed to more effective and deeper links. You can change the link but again, our recommendation is to write another article and add your deep link to that one. Keep your articles working for you! This is a great move! And every EzineArticles writer should know this important article. I suggest that this piece be a suggested reading whenever there’s a submission or re-review. I think extra care should be taken by author before their articles are submitted. Your articles should be proof read, double checked before you submit. Due to exposure to other sites where one can submit artricles, sites which seem to ignore quality to encourage quantity, I’m impressed with EzineArticles. It is good to know that your organization takes writing seriously. As a newcomer to EzineArticles, I’ll undoubtedly make a lot of ‘boo-boos.’ However, as I’m not yet running my own website, this isn’t, as yet, a serious issue. as far as I’m concerned. It’s really gratifying to know that real people get to check out our submissions before they reach an unsuspecting public. Very helpful, indeed. Thanks for these guidelines. This article deserves a 5 stars! :) It’s really worth readable and I can definitely recommend this to my friends. Below is a question I was going to ask too by Rob – I also only need to change my resource box as I no longer use those domain names with some articles I have submitted – is that possible? Yes, you can edit the resource but I’m guessing you’re asking if you change it without going through the article review process again and that answer is no. Even changing the resource box requires an editorial review. We’ve often visited the idea of allowing “mass resource box changes” but could never justify the change with the logic. To review the resource box alone, we are not able to review the relevancy to the article nor are we able to deter excessive linking. There is no simple solution to it.